Member Appreciation Fish Swap and Picnic. 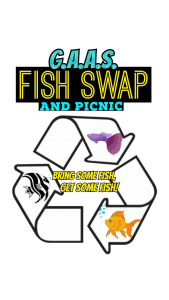 Our annual Member Appreciation Fish Swap and Picnic Is held during our August Club meeting on the second Friday of the Month, 8PM at the Ritchie Memorial Shelter. This is more of a Pot-Luck Style Dinner where we provide the main course and everyone pitches in and brings a dish of their choosing.